Ahuhu (Tephrosia purpurea (L.) Pers.) is a multipurpose tropical legume mainly used for green manure. It is used for pasture and browse in India and Africa, with conflicting results, possibly due to the presence of toxic factors, though this is not well established. 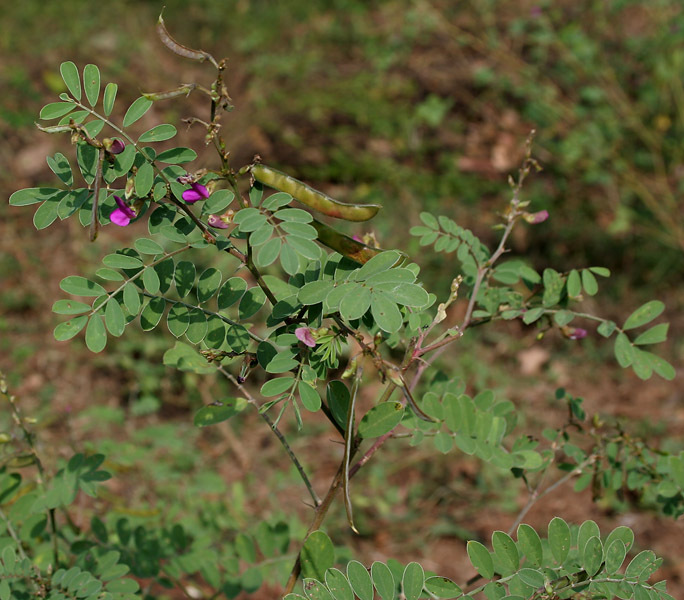 Tephrosia purpurea is an erect, annual or lived perennial legume shrub growing to a height of 40-80 (-150) cm. It has a long stout taproot, many slender branches, erect or decumbent at the base. The stems are cylindrical, woody at the base, with stiff coarse hairs, frequently reddish in colour. The leaves are alternate, compound, imparipinnate, 6-12 (-14.5) cm long bearing 6-12 pairs of leaflets and one terminal leaflet at their extremity. Leaflets are oboval in shape, 1-2.5 cm long x 0.3-1 cm wide, mucronate at the end. Their upper face is almost glabrous while the lower one has short hairs. The inflorescence is a terminal or axillary raceme, 2-20 cm long. Flowers are papillonaceous, pedicellated, solitary or borne in groups of 2, 3 or 4, pink or purple in colour, 6-10 mm in length. The fruit is a green, flat and pubescent pod, 2.5-4.5 cm long, constricted between the seeds. The pod becomes light brown at maturity and twists open to set seeds. The seeds are smooth, mottled, yellowish to dark brown or black in colour, flattened, ellipsoid, about 4 mm x 2.5 mm broad (Orwa et al., 2009; Bartha, 1970). 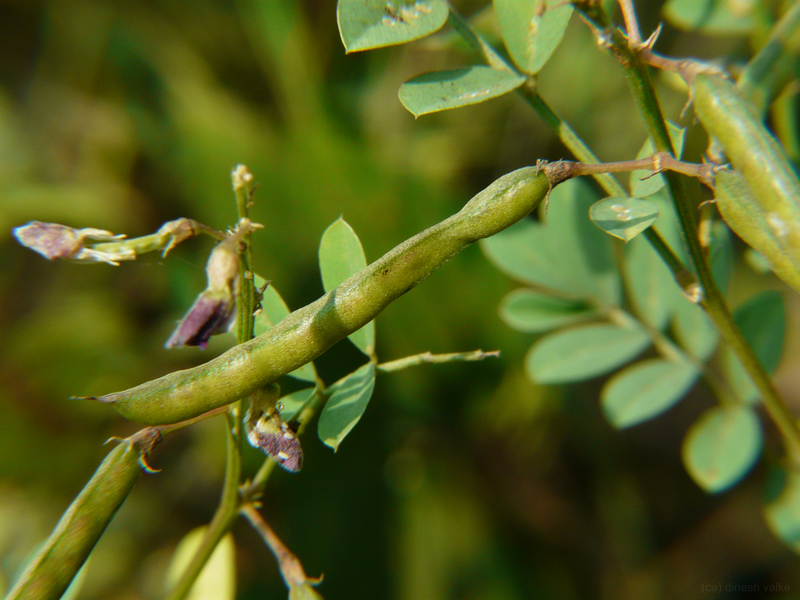 Tephrosia purpurea is a multipurpose legume. It is used as fodder but its value is debated, probably due to its poisonous content (rotenone and tephrosin). Its pounded leaves make a potent fish poison that is used for fishing. All parts of ahuhu are reported to have ethnomedicinal applications. In Africa, sheperds were reported to use crushed plants and make an antidotal beverage for animals bitten by snakes (Bartha, 1970). The leaves yield an orange-brown dye. The seeds are used in China as a substitute for coffee (Orwa et al., 2009). Ahuhu can provide temporary shade to smaller plants. An N-fixing legume, it can be used for green manure in vegetable, rice, coconut and banana fields (Orwa et al., 2009). It can be used in alley cropping to improve soil fertility, prevent soil erosion and conserve moisture while its leaves provide supplementary protein for ruminants (Fomunyam et al., 1987). 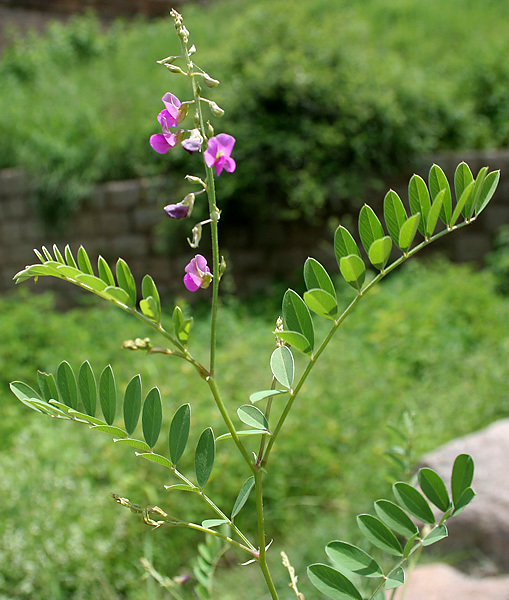 Tephrosia purpurea originated from the Indian subcontinent and China (Fern, 2014). It is widespread all over the tropics. It naturally grows in grassy fields, waste places and thickets, on ridges, and along roadsides, in Java. 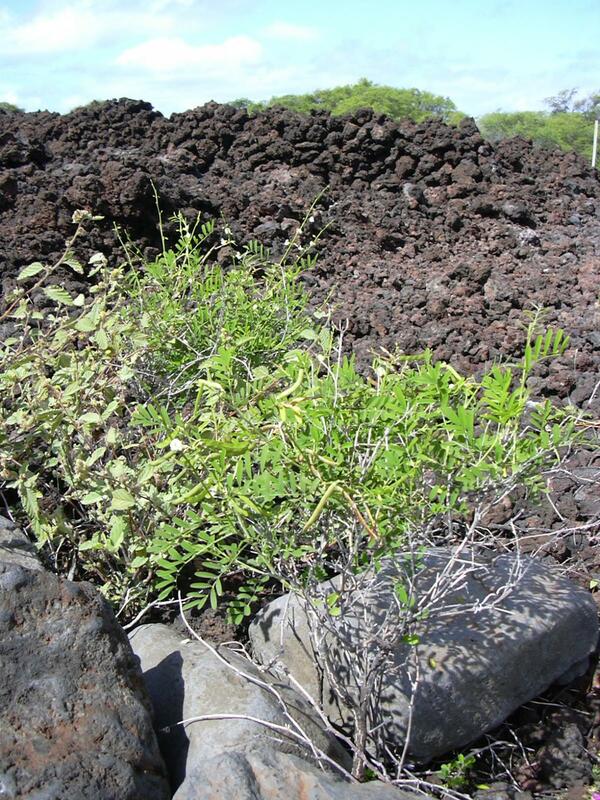 In Hawaii, it grows near the seashore (Orwa et al., 2009). Ahuhu grows from sea level to an altitude of 400 m though it can be found at up to 1300 m altitude. It prefers dry, gravelly or rocky and sandy soils, but in Madras (India) it grows well on loamy soils (Orwa et al., 2009; Bartha, 1970). It is tolerant of saline-sodic soil conditions (Orwa et al., 2009). Ahuhu produces many seeds and builds up a large seedbank in the soil (Orwa et al., 2009). It remains green during the dry season (Bartha, 1970). It is not suited for making hay but provides good silage fodder (Bartha, 1970). Tephrosia purpurea added to the soil as green manure increased humus content and induced the formation of large, stable soil aggregates. Planted on waste sites of coal mines and calcite mine spoils, ahuhu kept its nodulating ability and fixed nitrogen. It has been grown in India as a green manure on saline-sodic soils, alleviating soil salinity and lowering the pH (Orwa et al., 2009). Ahuhu has a moderate to high protein content (9-24% DM) but also a relatively high fibre content (about 60% NDF, 43% ADF and 17% lignin). The leaves and grains have a high ascorbic acid content which can be beneficial to animal health (Kapoor et al., 2013). Ahuhu has a variable content of phenolic compounds and flavonoids depending on season, location and many other factors (Pandey et al., 2016). The total phenolic content varies from about 6 to 22 g/kg DM, and the flavonoid content ranges from 5 to 22 g/kg DM. These levels increase from the cold to the hot and humid season (Pandey et al., 2016). 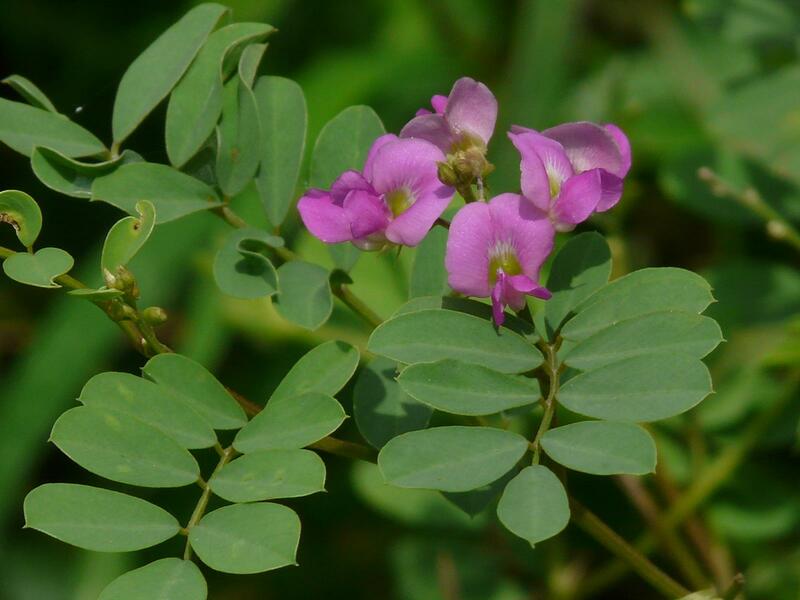 Tephrosia purpurea is reported to contain rotenone and tephrosin which are used to poison fish, but no report of morbidity nor mortality in its use as a feed was found (as of 2017). It is considered poisonous to livestock in Australia (Orwa et al., 2009). In India, but also in Ghana, Niger or Cameroon, ahuhu is used as forage to feed livestock, particularly goats (Bhatta et al., 2002; Calabro et al., 2007; Prabhat et al., 2014; Ziblim et al., 2015). This legume forage is appreciated as a supplement for grazing animals on poor paddocks (Mbomi et al., 2011). However, studies about its nutritive value are somehow conflicting. Though ahuhu was reported to be much liked by all animals in the 1970s, more recent litterature is less concordant. In Ghana, ahuhu is cited by livestock farmers as being used and preferred by livestock (Ziblim et al., 2015). In India, goats and sheep grazing natural rangelands did not consume ahuhu, though it represented about 49% of the total biomass and 20% of botanical composition (Rajendran et al., 2012; Bhatta et al., 2002; Bartha, 1970). In India, sheep offered ahuhu had a DM intake of 3.3 kg/100 kg BW (Tripathi et al., 2005). In young Barbari male kids (6-7 months), ahuhu offered with a complete pelleted diet containing 40% concentrate resulted in a DM intake of 4.3 kg/100 kg BW (Tripathi et al., 2014). In Cameroon, in young sheep and goats, Tephrosia purpurea included in a rice straw/maize stover based diet (28% DM basis), in a comparison with cottonseed cake (at the same dietary level), resulted in lower forage intake for both classes of animals. Animal growth rate was low or null and, after 2-3 months almost all animals died because of diseases of insufficient nutrient intake. It was concluded that 28% ahuhu could not sustain growing animal requirements. However, in adult sheep it was shown that DM digestibilities of ahuhu and cottonseed cake were almost similar (51 to 54%) when offered with maize stover or with rice straw (59-60%) (Fomunyam et al., 1987). In Cameroon, the protein content (24%) of ahuhu was well above the minimum requirement (7 and 8%) in tropical forage under which goat voluntary intake falls (Norton, 1994). Total live weight gains (+2.19 kg) of grazing goats fed ahuhu as supplement were significantly higher than the gains of animals which did not receive ahuhu supplementation (Mbomi et al., 2011). No specific information seems available in the international literature (July 2017) on the direct use of Tephrosia purpurea in rabbit feeding. In India, the hare species Lepus nigricollis was observed to consume plants that included ahuhu (Prakash et al., 1969). As noted in Ruminants above, ahuhu is used for fodder in India and Africa. Ahuhu could thus be used to feed rabbits, but feeding trials are necessary. According to the chemical composition, its calculated digestible energy content is about 7.5 MJ/kg DM, and its protein digestibility is about 60% (Lebas, 2016). Ahuhu is used as a fish poison and should not be fed to them (Orwa et al., 2009).